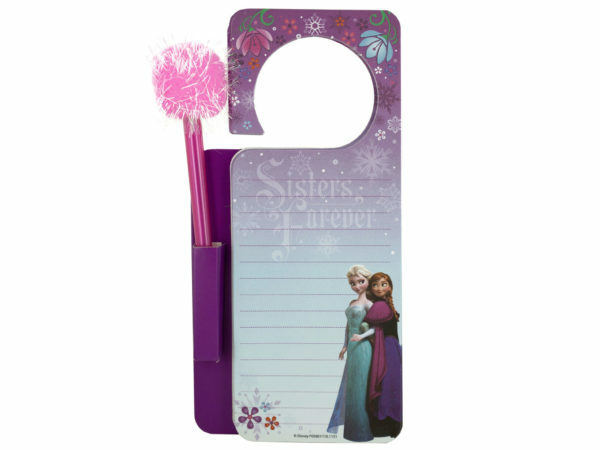 Make notes and reminders with this sweet Disney Frozen Door Hanger Memo Pad & Pen Set featuring a decorative lined notepad with Frozen graphics and a pink pompom pen in a holder next to the pad. Set conveniently hangs on doorknobs. Pad comes with 60 sheets and measures approximately 9" long x 3.5" wide. For ages 3 and up. Comes packaged in a poly bag. **We are running low on stock of this item. Please do not order more than 20 items.